After a long day at work and a margarita from Gloria’s, Kassidy and I found ourselves at home with nothing to do. So like any two bored white girls, we came up with an excuse to meet our neighbor. "Let's pretend we need help opening this beer bottle," we said to each other, thinking we had just solved the world's problems. It won't be weird that it's a Tuesday night. After about five minutes speaking with him and slowing creeping into his apartment, we learned a lot. A LOT. Like, ok??????? Do you not care about security at all???? I know we’re pretty, but you barely know us???? What if we were murderers???? Like, you need to learn to protect yourself. Somehow I made it far enough into his apartment to see in his bedroom. What I found will shock you. SHOCK YOU. Not really, but I love drama. There was a punching bag. A PUNCHING BAG. Apparently he boxes. In his bedroom. Idk, it was kind of weird, but kind of hot at the same time. He was babysitting his mom’s cat, which could mean he’s a mama’s boy and will do anything for her. Or maybe he just has a cat but felt the need to lie to us? It's all a little terrifying. While I was trying to keep the conversation alive long enough to absorb everything, Kassidy was assessing everything with her mind. This was her thought process: This is weird. Why is he wearing the same clothes from a week ago? His cat his trying to escape. God. If I rescue it maybe he'll ask me on a date. Okay. I saved it and nothing. Why is he so awkward? He's cute though. He missed us. I can tell. Why is there a pinball machine in here? With cats, too? Did he draw those things on the wall in prison? Oh, he's bleeding. That's hot. It's from your mom's cat? Nevermind. The cat is trying to run away again. Is this a sign? I can barely see into his bedroom but it looks messy. But it's all blue. I like blue. We're leaving? Okay. Bye. Miss you. He lives alone, which can only mean he's either really effing weird or he's just an independent man who don't need nobody. When we asked what Internet company he used, he told us he doesn't have WiFi. He used to steal his neighbor's, but that failed. We also tried asking him what he does all day, but we never really got a straight answer. Do you just draw your drawings all day??????? Do you watch Fast and Furious all day?????? Do you have a job?????? Who doesn’t have WiFi????? Do you steal everything you want???? When he greeted us at the door, he was wearing a beanie in this very cold weather. This means he’s frugal, which is admiring because times are tough out there and it's nice to know we aren't the only cheap people in the building. 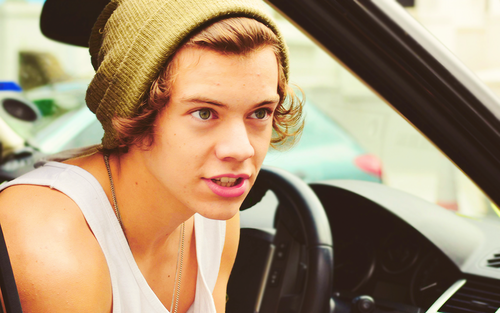 he does not look like harry, but i can appreciate any guy in a beanie.